I remember now why I came here. This feeling, of floating up overhanging rock, fingertips finding and gripping every edge, every crevice, like a child in a tree blissfully unconcerned about height or danger. Instinct takes care of decisions without bothering me. Where best to head for and how best to get there appear to decide themselves. And I am strangely unconcerned by the scant protection available and the unthinkable consequences of falling. Already a distant memory is the headache of planning an expedition deep into the heart of Venezuela in the aftermath of major political unrest. Even the jungle approach, machete trail-breaking, heavy loads, irrepellable insects and constant damp heat are no longer important. I am left with pure enjoyment; movement, freedom and grace, and I relish every second of it. 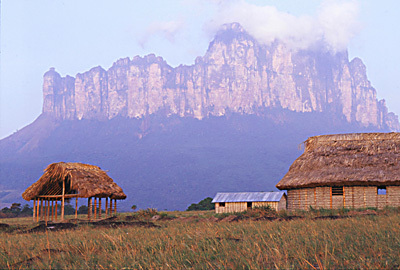 Acopántepui had only one route up its left-most pillar. 'Pizza, Chocolate y Cerveza' climbs directly up the 600m cental tower. Occasionally I have this feeling when running. For an all-too-brief moment during a good run it is as if my body is running itself, needing no help and certainly no effort from me, like I’m just there to enjoy the ride. But for this to happen when climbing is wonderfully intoxicating. Here I am climbing moves I’ve never done before, that I’ve never seen before, that nobody has ever seen before. And they’re flowing past with the ease and effortlessness of a well-rehearsed routine. It is a shame to have to rejoin the real world when I run out of rope and need to find somewhere to belay. “I’m SAFE,” I shout down when I’ve arranged a belay, and as I flip my heels out of my shoes to ease the pressure on cramped toes I set to belaying Anne and Alfredo as they follow. My gaze wanders over the roof of the forest, across the open grassy plains of the Gran Sabana, and comes to rest on a distant tepui – a flat-topped rocky peak much like Acopántepui, the one we’re attempting to climb. Its sheer walls give it the appearance of a fortress, an impenetrable stronghold many times higher than the grandest castle. Its summit is green, alive with plants no doubt very different from those crowding its base. 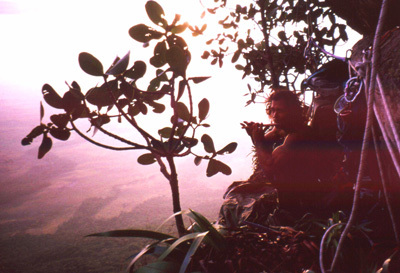 For the tepuis are evolutionarily magical places, whose summits have an ecology all to themselves, protected as they are from the attentions of the many creatures roaming the scrub and the treetops of the jungle far below. Venezuela is indeed a land of beauty and of contrast. It is hardly credible that my breathtaking panorama is just one of a huge number of spectacular vistas for which this country ought to be far more famous. Most people are aware of Angel Falls, at nearly 1000m the highest waterfall in the world, but how many know it is just one of hundreds, if not thousands of jaw-droppingly beautiful cascades? And how many are aware of the unspoiled, snow-capped Andean peaks of the Sierra Nevada and Sierra La Culata, or the scores of uninhabited, coral-rich islands in the archipelago of Los Roques, lost in the turquoise expanse of the Caribbean beyond the surf-fringed beaches? For climbing too this is paradise, though the nature of the objectives make it unlikely that popularity will ever be a problem. The cliffs are big, with even the smallest tepui walls reaching several hundred metres in height. They’re hard too; because tenacious plant-life thrives on angles as steep as vertical, to climb clean rock is to climb overhanging rock. These factors alone should be enough to cut down considerably the list of potential suitors, but then there is the remoteness. Not even 4x4 vehicles can get close. Light aircraft, helicopters and dugout boats are the only way in, usually combined with a wild jungle trek to the foot of the chosen wall. Paradise it may be, but easy it certainly isn’t. “This is horrible!” Anne shared my pleasure on the previous pitch but isn’t at all impressed by the amount of loose rocks on one above. It is hard to tell which pieces will stay in place if used as handholds, and equally hard to be sure that any rocks pulled off won’t sever the ropes below. She begins tapping each hold with her knuckles, leaving the most hollow-sounding well alone and trying to distribute her weight evenly between as many of the others as she can. All of which is not easy while at the same time having a two-metre overhang to surmount. Successfully negotiating this obstacle is a big relief, as it allows us to haul our large bags of equipment, food and – most critically – water without fear of dislodging further debris. Each tethered bag is released in turn, swinging out into space like a giant pendulum before being heaved up by the toiling leader. But relief is short-lived, as it is now late into the afternoon and the good ledges we hoped to find have not materialised. The climb is going to take many days, and unless we can sleep the nights will be long and the days ahead fearsomely hard work. The ledge we’re on is about a metre long and triangular. Hardly ideal but better than nothing. We find a similar one just below, and by nightfall the three of us are established on cramped, precarious and vertiginous perches. In the distance we can make out the dim lights of Yunek Ken, the village we flew into despite the lack of any discernable airstrip. We arrived without prior notice, almost inevitably since this tiny Pémon Indian village has neither telephone nor radio links with the outside world. Even so the villagers were more than happy to help carry our heavy loads to the tepui. 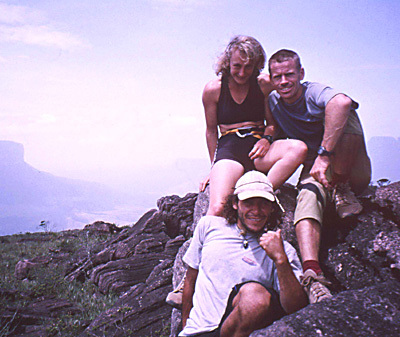 The local chief is quite familiar with climbers, Italian and American teams having been here in recent years to attempt the tepui. 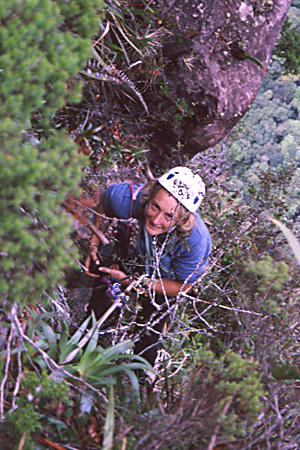 In fact he has seen more climbers than travellers or trekkers. The area is not mentioned in the Lonely Planet guide and as a result the number of Western travellers who have found their way here can be counted on one hand. Accordingly village life is amazingly unaffected by cultural and technological developments we take for granted. Travel is either on foot or in dugout canoes and almost all food is picked, grown locally or hunted using home-made cross-bows and blow-pipes. Radio reception seems to be the only major difference to life in Yunek Ken since the Spanish introduced Christianity in the 17th Century. "a melody carried on the morning breeze we recognise at once as one of Alfredo’s favourite tunes"
We wake on our ledges to the sound of music, a melody carried on the morning breeze we recognise at once as one of Alfredo’s favourite tunes. Alfredo is a Venezuelan friend we climbed with the previous year after meeting in Caracas. He jumped at the chance of attempting Acopán with us, and brought with him immensely useful local knowledge without which we might never even have reached the base. He has brought also a collection of musical instruments from Bolivia and Peru, and calms many a stressful moment with a few bars on flute or pipes. Three days of exhilarating climbing and we’re cruising, though the nights squeezed onto inadequate ledges have been less of a pleasure. The climbing’s been hard – about as hard as we could have coped with and yet remained on course to reach the top while we still have food and water. But we’re feeling especially good now. Three hundred metres of overhanging rock is beneath us and the way ahead looks clean and featured enough to be possible within the three days our supplies will last. Despite tired limbs the rock passes quickly by. We’re in tune with the wall now; we know its character, its personality, and its tricks. We can ‘read’ the way ahead, and our team is functioning smoothly, almost without need of communication. We’re on a roll. Until we see the roof. “Where did that come from?” We look at one another incredulously as the huge projecting ceiling comes into view above us. We didn’t spot it when we scoped the wall from the village and it has been out of view until now. But there it is, fully 12m of overhang, and we aren’t imagining it. Neither are we optimistic about our chances of climbing it. Even though it is still two pitches above, it looks monstrous and terrifying. We look for ways around it, but the roof extends a long way to both left and right. Traversing the blank walls would slow us down badly, and we really don’t have time to spare if we are not to shrivel like prunes with dehydration. Our water supplies are already severely stretched. "there it is, fully 12m of overhang, and we aren’t imagining it"
On any big wall water is a major problem, but here the heat further exacerbates it. How much does an active person needs to drink each day in a hot and humid climate? Five litres? More? All the theory would suggest more if that person is to perform at their best. But even five litres a day for six days would weigh 30kg. And that’s just for one person. If we were to try and haul that much extra weight each it would take more than our six days, which then would mean we would need more water. We have limited our water to just two litres each per day, which may not sound too ridiculous until you realise half of this is used in rehydrating meals. With only one litre a day for drinking and washing, a little dirt no longer seems such a problem. As we near the roof we begin to see possibilities. The angles no longer look quite so impossible and we can make out cracks. Mentally we trace a potential line through the bulging rock architecture and manage to convince ourselves it may not be so bad after all. But close up this illusion is shattered. The real steepness is undeniable as the wall bulges out intimidatingly above us, guarding access even to the base of the ceiling. But we’re here now so we may as well give it a try. 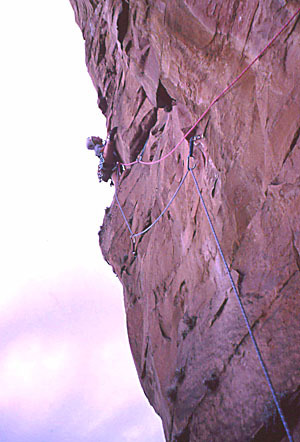 The look on Anne’s face as she approaches the next belay makes me wonder whether this time we really have overdone it. I’m glad she didn’t fall on that pitch; I wasn’t strictly truthful when I said it was safe, and a slip could well have launched her into mid-air, 400m above the verdant roof of the jungle. While unlikely to cause her any physical harm, it would have been a terrifying experience. And then even for a climber of her experience, regaining contact with the rock would be a complex, nervous and energy-sapping trial. "enough exposure to keep a minor celebrity in work for a lifetime"
As it is we’re now in the most inaccessible, most intimidating and most lunatic place I can remember ever having the arguable pleasure of belaying; tucked into a tiny corner in the very heart of the huge, bulging roof, under a large ceiling of smooth, compact sandstone. The way here was hard and irreversible, and from here our choices are severely limited by the patently unclimbable ceiling above us and the severely overhanging walls to either side. Our only chance is to the right, where the ludicrously undercut sidewall is teasing us with the promise of a horizontal crack leading out under the ceiling. But from here the crack is tantalisingly out of reach and frustratingly out of clear view. “The way I see it we have three options,” I explain in as matter-of-fact way as my racing pulse permits. “Ideally we’ll be able to climb directly up to the ceiling from here, and what looks like it may be a handrail will lead from there the fifteen or so metres out right to the edge, where we’ll find big holds to pull round on.” We both look out right, then above us trying to envisage moves up the decidedly blank wall, then back at each other as it is all too obvious this first option isn’t going to happen. No matter how stupid we may have been to find ourselves in this situation, to compound it by trying ridiculously hard moves above the hollow block we’re both tied to would be asking for serious trouble. “The second option, “ I continue, “is to find some holds around this corner here…” whereupon I extend my tether and lean across from the belay, past the tiny sloping edges we can see, which probably aren’t good enough but just might be, to find that even these melt into a smooth and unclimbable wall. Our eyes meet again, just as Anne is trying to stop her look of ‘this really isn’t fun any more’ from becoming one of genuine terror. For we both know only too well what the third option is. Our eyes drop as we look down at our feet, where the end of our tiny ledge dissolves into a horizontal fissure running along the very lip of the undercut sidewall. Lowering myself, I begin swinging nervously but excitedly along it, feet dangling uselessly over the void, and with enough exposure to keep a minor celebrity in work for a lifetime. I meet a crack and follow it upwards and outwards to the ceiling itself. Wow! What a route! I feel intoxicated by excitement and adrenaline as I hurriedly slot some gear into the crack, at the same time trying hard to prevent the sustained exertion from turning my forearms to jelly. Glancing rightwards, I see to my delight a line of flat handholds, albeit without accompanying footholds, leading right to the lip of our great barrier roof. All that remains is a race, a controlled burn, to make sure I make it across before my arms give out. "The summit arrives almost unexpectedly"
The clouds have been building for a while and we’ve been quietly ignoring them. Each of the last few afternoons has been the same and the worst we’ve seen has been brief passing showers. But this time we’re getting worried. The massing clouds are darker and more widespread than before and telltale swathes of rain are already sweeping across the plain, giant theatre curtains heralding the close of our happy scene. Our delight in successfully rounding the roof quickly turns sour as we realise we are now totally unprotected from the elements. Abseiling back under the shelter of the overhang is no longer possible as the other ends of our ropes now dangle uselessly in hundreds of metres of space. Meanwhile the rock above is becoming steadily wetter and more slippery. Unable to move in any direction, we resign ourselves to a long sleepless night of discomfort. Hanging in harnesses and concentrating hard to avoid dropping anything, I hold the lighted stove in one hand and the pan in the other while the others search for and prepare our dried pasta meal. We do our best to ignore the rain and set about making the most of what little comfort we can find. We have a couple of hammocks, and by arranging them one above the other we are able to at least take the weight off our harnesses. They have a nasty habit of restricting blood circulation after a few hours of hanging. But two people in one hammock squashed against a jagged wall is hardly the lap of luxury. And with rainwater falling, dripping and soaking every unprotected inch, sleep seems a distant prospect. This is probably not the ideal time for Anne to admit she’s never slept in a hammock, having been nervous about the idea in the past. Nor the time for Alfredo to admit this is the first time he’s ever bivvied on a ledge, let alone on a blank wall. The night is indeed long and unpleasant. For all my added experience, I sleep the least of all of us and am delighted when the sky brightens, even more so when the sun appears and the rock ahead ceases to glisten. Surely we must have cracked it now? We climb on, ever upward and outward, though increasingly the rock holds are supplemented with plants of various types. At one stage the rock holds disappear completely and I resort to jumping for a bush on the edge of a small overhang, though I have no idea whether it will hold my weight. I quickly develop an intimate knowledge and appreciation of the local flora, albeit largely in terms of which species attach themselves the most firmly. "It is eerie to think that nobody has ever been up here before"
The summit arrives almost unexpectedly, late in the afternoon of our last day’s water. We collapse in three heaps, revelling in the joys of being horizontal and in our freedom to untie from ropes that have bound us together for almost a week. Thankfully we find water on the tepui top, much of it scooped from shallow puddles in the boulder-strewn terrain. This enables us to linger an extra day and explore our new domain. It is eerie to think that nobody has ever been up here before, that we are the first to see the remarkable wind-carved rocks and the delicate purple orchids. We feel privileged and honoured, and take extra care to leave this paradise very much as we found it. With so much overhanging rock around we are understandably more than a little concerned about the descent. We have to abseil down a 600m wall with 100m ropes. Despite descending a section of cliff we believe to be a good deal less overhanging than the one we had climbed, it nevertheless sees us swinging near the end of our ropes, frantically trying to regain contact with the wall to fix anchors for the next abseil. It’s more than worth it though. Waiting for us at the bottom, safely protected from the attentions of the monkeys, porcupines, jaguars, snakes and legions of ants, is the stash of fresh food we’ve all been dreaming about. 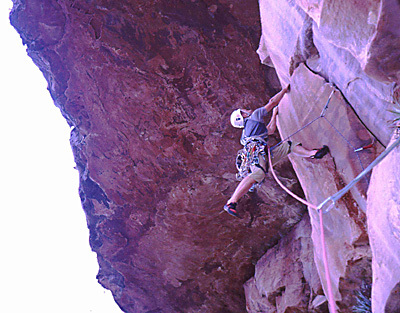 Summary: An account of the first ascent of Acopántepui, Venezeula. 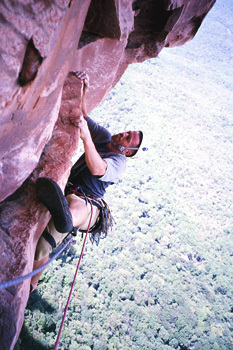 The route, ‘Pizza, Chocolate y Cerveza’, 600m, E6 6b, on the central tower of the tepui, was climbed entirely onsight in six days in March/April 2003 by John Arran, Anne Arran and Alfredo Rangél. They took no falls, hammered no pegs and drilled no bolts in the process. The expedition would not have been possible without generous support from The North Face, Beal, Petzl, The Mount Everest Foundation and the BMC, to all of whom many thanks are due. 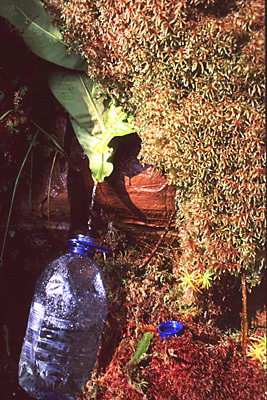 This article, by John Arran, first appeared in the 2003 Alpine Journal.